Type Coercion is the conversion of one type of object to a new object of a different type with similar content. Tapestry frequently must coerce objects from one type to another. A common example is the coercion of string "5" into an integer 5 or a double 5.0. Although type coercions happen more inside tapestry-core (including coercions of component parameters ), they may also happen inside tapestry-ioc, such as when injecting a value, rather than a service, into a builder method. There are a few special coercions related to null there; Object --> List wraps a lone object as a singleton list, we then need null --> List to ensure that null stays null (rather than a singleton list whose lone element is a null). Coercing from null is special; it is not a spanning search as with the other types. Either there is a specific coercion from null to the desired type, or no coercion takes places (and the coerced value is null). The only built-in null coercion is from null to boolean (which is always false). TypeCoercer is extensible; you may add new coercions as desired. For example, let's say you have a Money type that represents an amount of some currency, and you want to be able to convert from BigDecimal to Money. Further, let's assume that Money has a constructor that accepts a BigDecimal as its parameter. We'll use a little Tapestry IOC configuration jujitsu to inform the TypeCoercer about this coercion. 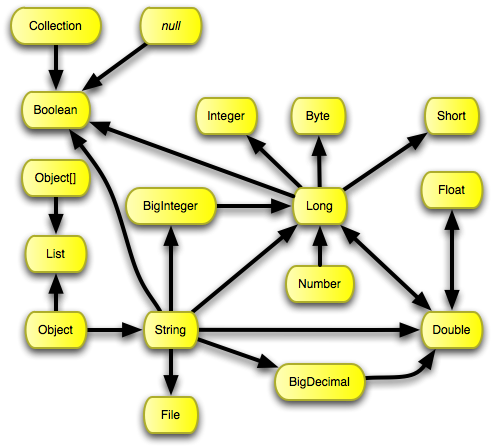 Further, since TypeCoercer knows how to convert Double to BigDecimal, or even Integer (to Long to Double) to BigDecimal, all of those coercions would work as well.